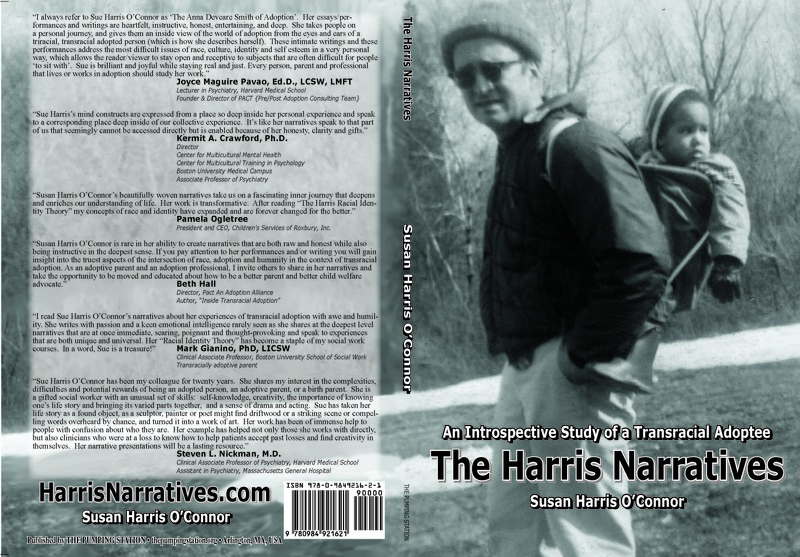 This book consists of five autobiographical narratives by Susan Harris O’Connor, a social worker and transracial adoptee. These monologues were developed and performed around the United States in academic, clinical and child welfare settings to wide acclaim over the last sixteen years. They will be of immediate interest to scholars of race, identity, emotional intelligence, adoption, child welfare, as well as clinicians and those directly impacted in families created by adoption. The book will also speak to writers, performers and individuals interested in developing their voice through self-exploration. In her narratives the author explores in depth: the impact of foster care during the first 14 months of her life; her relationship with her unknown birth father; the role of race and racism for transracial adoptees who grow up in white communities; the development of her racial identity and a model derived from these experiences, and the relationships between her different identities or mind constructs, her inner strengths and vulnerabilities, and the outside world. There is a progression one chapter to the next, chronicling greater understanding, deeper reflection, and a developing voice. This is an original and sophisticated exploration of the inner life of a transracial adoptee and the forces that helped shape her life. It is at once a case study and an observation of the human condition with universal appeal. This entry was posted in books on January 5, 2013 by Peter J. Taylor.